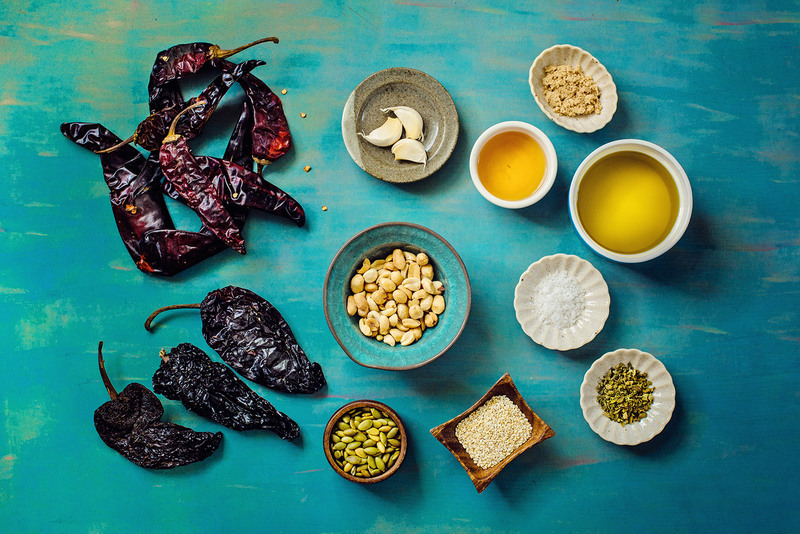 Salsa Macha is a smoky, spicy, nutty, Mexican chili oil hailing from Veracruz that is excellent on grilled meats, eggs, cheese, veggies and even a nice alternative to tomato-based salsas with your chips. Oh, and the heat is totally customizable. My father loves his salsa. When I was younger, he’d make it in large quantities and he and my sisters would devour it in no time. I have not been shy of announcing here how much of a wimp I am when it comes to very spicy food. I usually go for medium heat, not the kind that knocks you over with the first whiff, and then pummel’s you as you eat it. Nope. Give me a 1 or 2 alarm heat any day. Let me enjoy the smokiness of the pepper, or the freshness of the tomatoes and the slow build up of heat on my tongue over the course of a meal. This is more my speed. Which is why, when I first heard of this salsa, I was very intimidated by it. 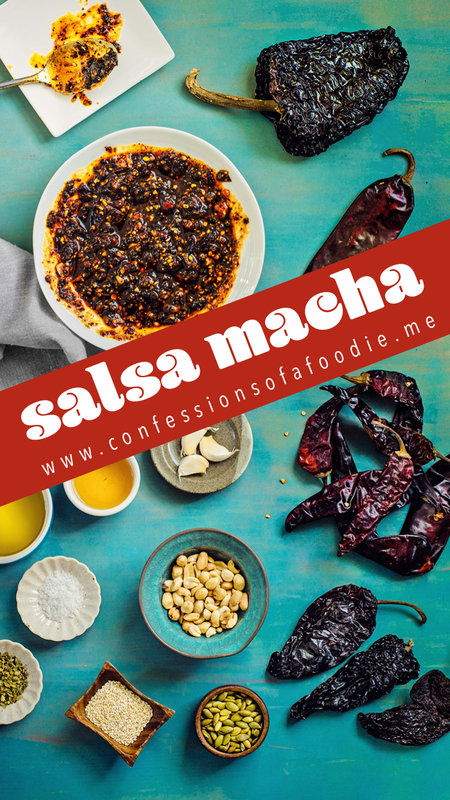 Salsa macha hails from the state of Veracruz in Mexico. “Macha” is the feminine of the Spanish word “macho” which can mean anything from overly aggressive to domineering to virile or brave. So the thought behind naming this salsa “macha” is that you need to be rather brave to eat it as it’s made with nothing but spicy dried chilies, oil and nuts. I’m not that brave so I figured this salsa was not for me. This past summer I took a mole making class presented by the local chapter of Les Dames d'Escoffier. The presenting chef, Flor Franco, is from Veracruz and I was excited to learn a different style of mole making. After the main presentation, while we were waiting for the kitchen to prepare dinner for us, the chef brought out her salsa macha. It was delicious. She didn’t use the chilies de árbol that all the recipes I’d seen used. 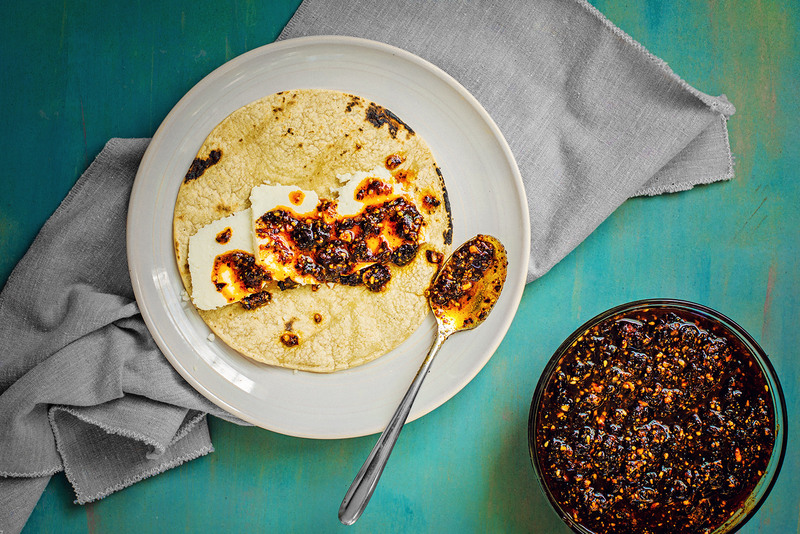 Her’s mimicked the chilies she used in her mole: ancho and guajillo chilies. 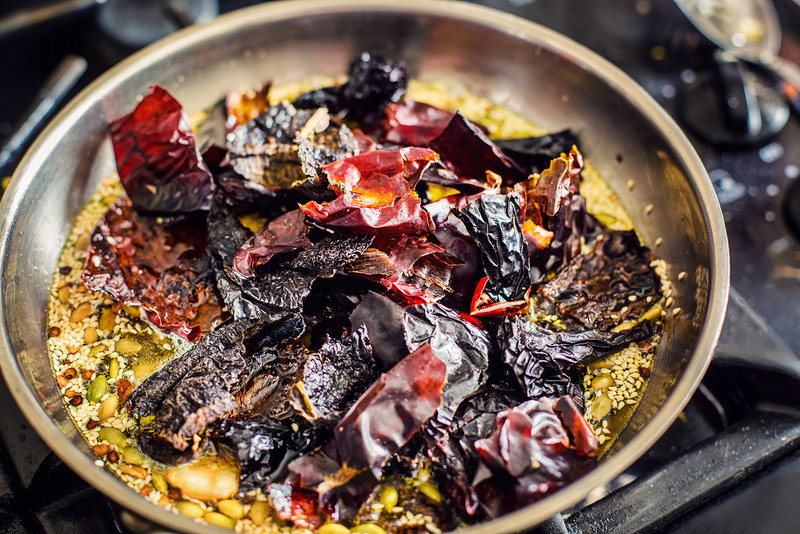 The ancho are dried poblanos so they added a smoky, slightly sweet overtone and the guajillos gave color, body and a mild chile flavor. She also added some of the seeds along with the nuts and sesame seeds. We dipped freshly made corn tortillas into it and it was heaven. That’s when I learned that the salsa can be modified to individual tastes and still evoke the essence of the original inspiration. This has become one of my favorite condiments. I put it on eggs, in my tacos, on my tortas, on my steamed veggies, as a meat marinade. 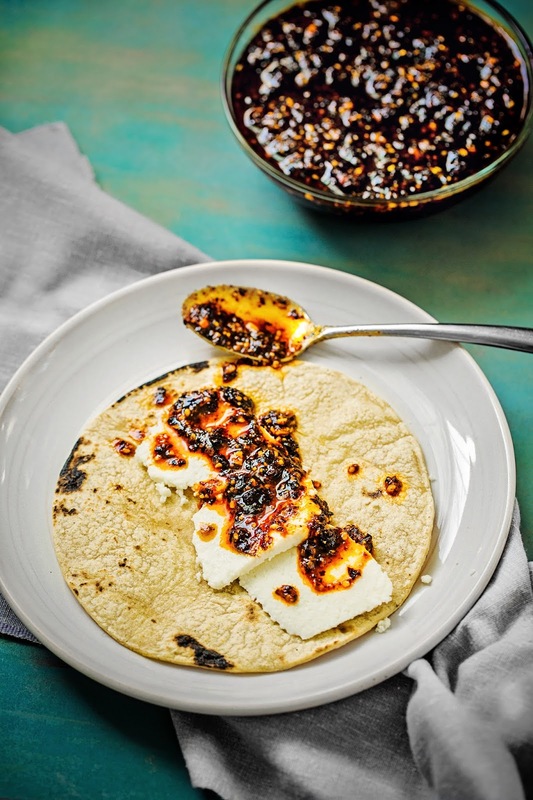 I cut off some slices of fresh queso fresco, add it to a warmed fresh corn tortilla and drizzle this salsa on it. It’s smoky, it’s mildly spicy and nutty and utterly customizable. Want it hotter? 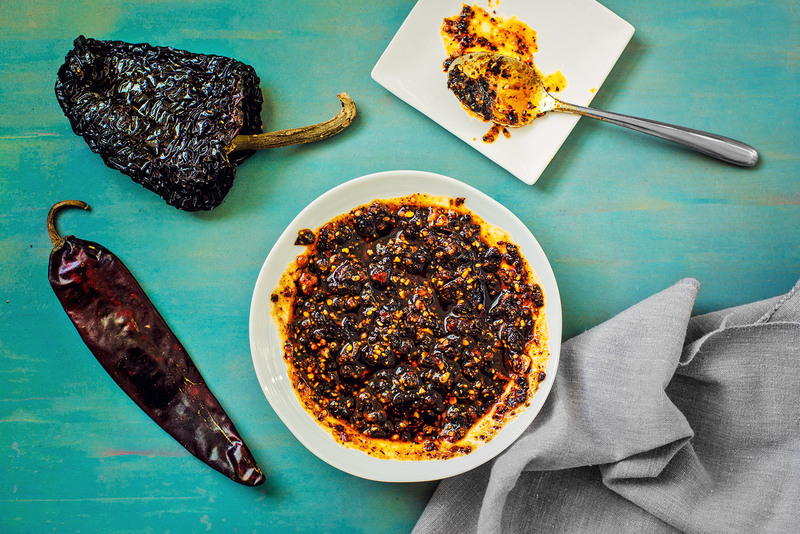 I call for one chile de árbol, but you can use more. Or use dried chipotles if you want the smokiness but with more heat than an ancho will give you. The main thing is that the chilies are dried, not fresh and they need to be fried in plenty of oil so that the oil is infused with their flavor. 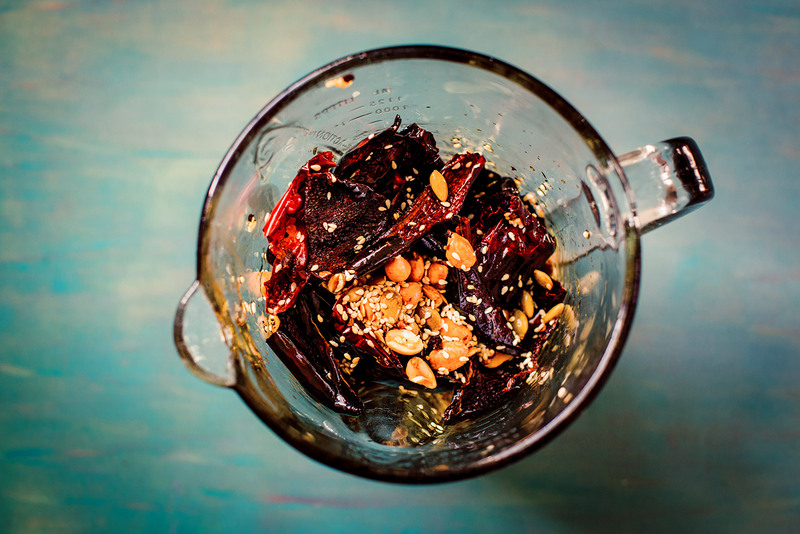 Think of Thai chili oil ... with nuts. I hope you try this salsa. It’s definitely different than the typical tomato-based versions you're think of when you think of Mexican salsas. You might not want to serve it in place of your chunky spicy tomato salsa or smooth taqueria salsa with your chips but try serving it along with them so that your guests have a different experience. And maybe just convert them, too. First step is to clean the chilies, that includes wiping them with a damp towel to remove some of the dust. Then cutting off the stems and removing the seeds and veins and tearing them into pieces. 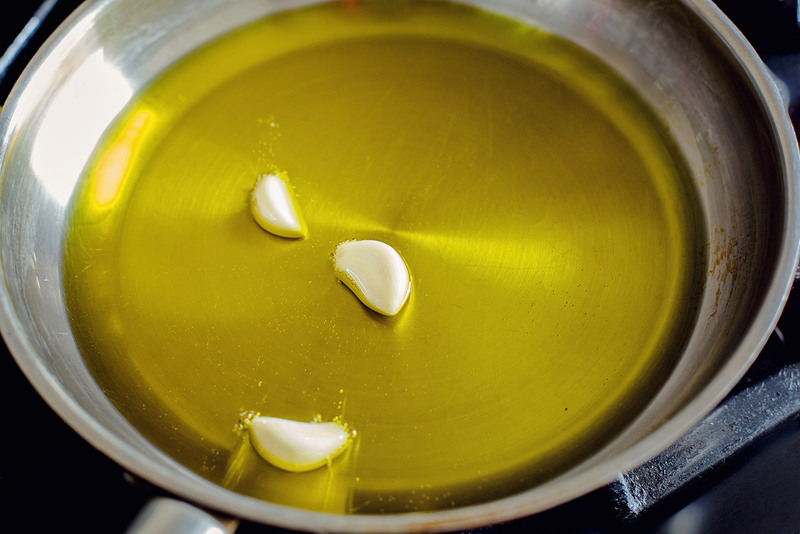 You heat up oil, I love using my favorite California olive oil, toss in some garlic to brown lightly. And sesame seeds and fry them until they're toasty and fragrant. Next go in some of the reserved seeds from the chilies. Lastly, the chilies go in and get bathed in the fragrant oil, hanging around with the heat off, soaking up all the deliciousness. Then it gets whizzed in the blender to a chunky pesto consistency and you're good to use. This stuff is great on almost anything but especially in quesadillas. 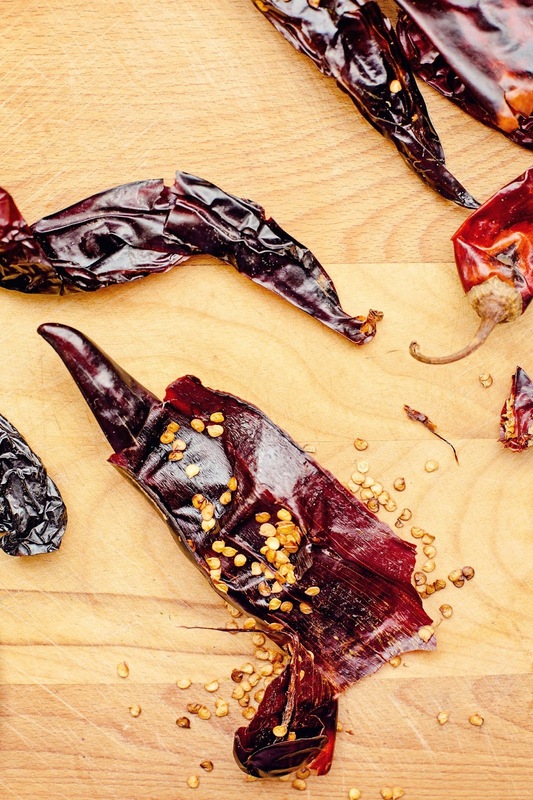 Wipe chilies with a damp paper towel to remove some of the dust. For the chiles de árbol, remove the stem leaving the seeds in the pod for some added heat or remove them for a slightly less spicy result. For the bigger chilies, either tear or cut off the stems, slice or tear the chilies down the center to open and reveal seeds and veins and remove them. Reserve 1 teaspoon of the seeds, discard the rest and the stems. Set chilies and reserved seeds aside. Heat oil in a sauté pan on medium heat until just starting to shimmer but not too hot and definitely not smoking. 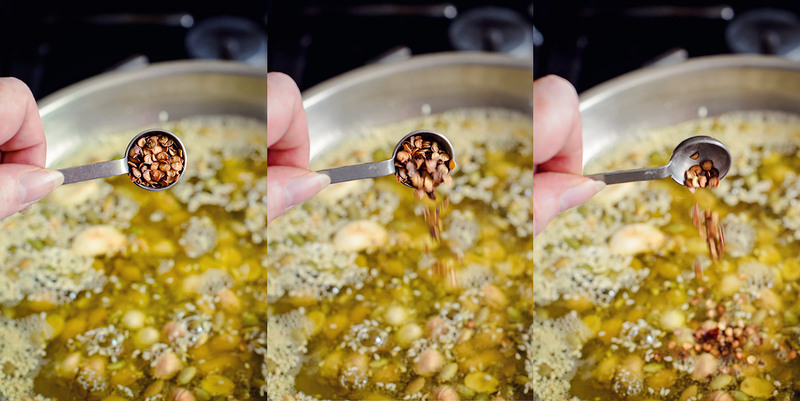 Carefully add the garlic cloves, stirring to keep them from burning. 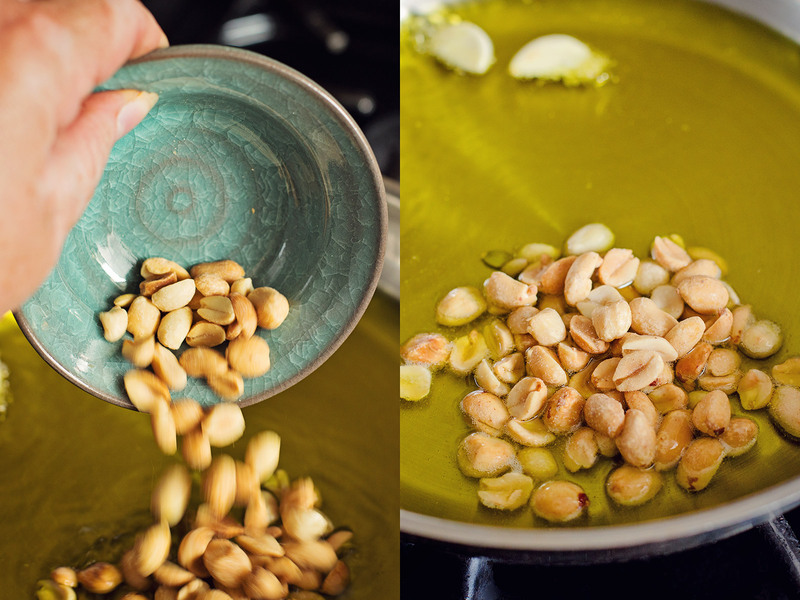 Once just starting to color, about 2 minutes, add the peanuts and stir, cooking for 30 seconds. 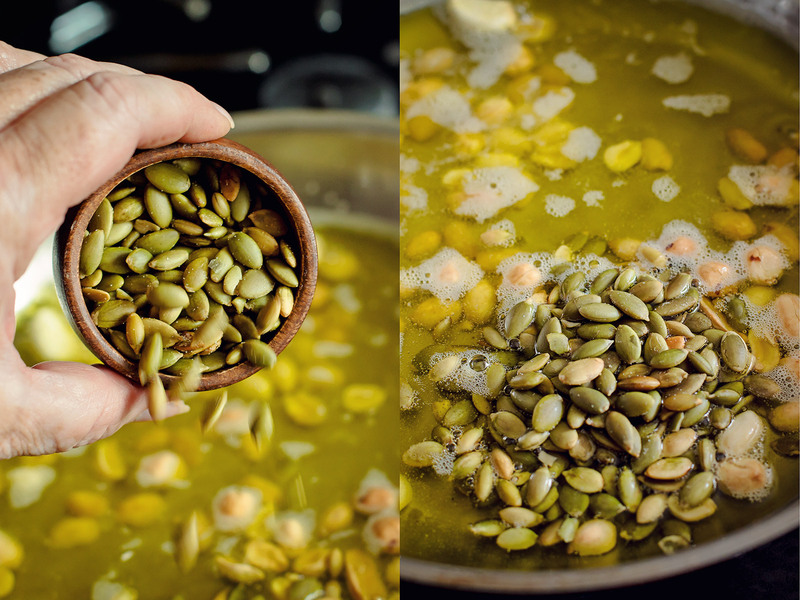 Add the pepitas, stir, cooking for 30 seconds. 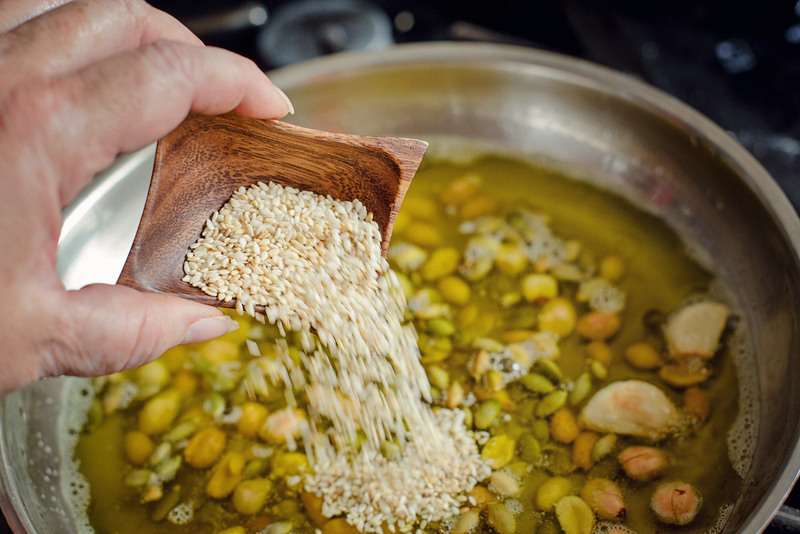 Add the sesame seeds, stir, cooking for 2 minutes or until the seeds and nuts have just turned golden. Add the chili seeds and chilies. Sauté for 30 seconds then turn heat off and allow chilies to steep for up to 5 minutes. Carefully transfer all to a blender and pulse until you get a coarse pesto. Don’t over process, you want it fine enough so there are no big chunks of dried chile and the peanuts have been broken down but not so fine that it’s puréed. Transfer to an airtight container like a ball jar. It’s wonderful still slightly warm but once it cools completely, refrigerate. It will keep in the airtight container for a month in the refrigerator, if it lasts that long! It’s best at room temperature so either pull it out early and allow it to warm up while you prepare your meal or, portion out what you think you’ll use into a microwave safe dish and zap it for 10 seconds to take the chill off. Stir and serve.